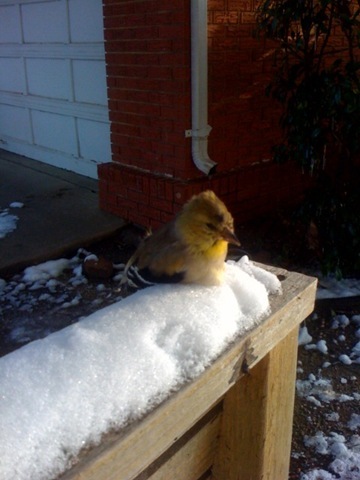 It’s a golden finch, frozen in lifelessness on the back of a lawn chair. Sometime yesterday afternoon or evening, it landed there, and died. It was not frozen to the back of the chair; it could have, had it chosen or been able to, gone elsewhere. But here, looking toward a live oak tree and a pile of firewood underneath, is where it landed, went to sleep, and died. 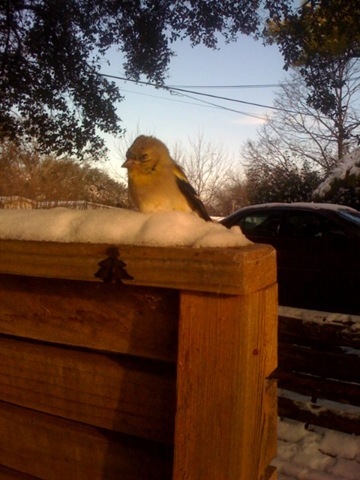 Yesterday, an unusual snowy day in this part of North Texas, was a feeding frenzy for finches in the front and back yards. I spread almost 25 lb. of sunflower seeds out during the day and all of it is gone this morning. The finches were joined by several cardinals in their hunger and inability to get at their usual fares of wild grass and thistle seeds, and the occasional mockingbird stopped by, too, though they prefer their meals warm and wiggly. This is the first time I’ve seen a finch, or any bird, die this way. Had it been warmer, it may have landed, died, but then fallen to the ground in the grasp of gravity. But here, frozen in place, this one remains, eyes still open, stiff and posed in the posture of sleep. I’m thinking, as I looked closely at it this morning: “What a great way to go!” I have no idea about the consciousness of death which a bird, or any animal, might have. I think we humans make the mistake of assuming that all animals besides ourselves go through their lives in a dull litany of pre-programmed instinctual behaviors that they have no control over, on their way to a death of which they are utterly unaware. Those assumptions, of course, are born in the prevailing human attitude that the universe, from microbes to galaxies, is a mechanistic, unthinking set of interrelated parts, adding up to a whole for the benefit of humans. Our own instinctual behaviors, in that worldview, are “negligible” in light of our “superior” abilities to evaluate, rationalize, and choose. But I think, without a shred of scientific or spiritual data to back me up, that finches know a lot more about what they’re doing than we may have the calibrated instruments or divine revelations to even begin to understand. They certainly do not process, share, or make as many choices within that finch knowledge as our brains enable us to make. But their brains, like ours, have adequately developed for their needs now, in this particular epoch of relational life on earth. After all, this is the fourth spring in a row where some finches- not all of them!- have chosen to stop for awhile on their way north from Mexico, in this backyard, in this little town, on this little acre among the kabillion others in North Texas. Grandma and Grandpa finch must have had some information which they somehow passed along!? And while finches may not have the ability to reflect on their own consciousness, they probably don’t spend an ink dot of time reflecting on the finitude of their lives either. Certainly, they do not live their lives in the obsessive dread of death that many of us do. Still, though, this finch chose to stay perched, on this chair, and wait in a way that it had never waited before. Without a single step to the left or right, it landed, sat still, slept, and died. What did the finch know and when did it know? What finch memories began to fade as the hours (or minutes) passed? Is there a place within its flock that today is noticed by its absence? I don’t know the answers to these questions, but I will come back to them for days. Join me in that speculation, if you’d like. Take a look once more at the pictures of that finch. In very real ways, I believe, it has taken flight once more. And is flying around us all, right now.